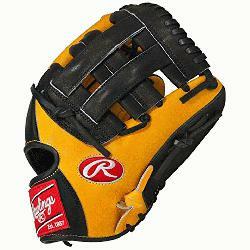 Rawlings Heart of the Hide Baseball Glove 11.75 inch PRO1175-6GTB (Right Handed Throw) : The Heart of the Hide players baseball glove series features the game-day patterns of the Rawlings Advisory staff. Available in select Heart of the Hide models, these high quality gloves have defined the careers of those deemed The Finest in the Field, and are now available to elite athletes looking to join the next class of defensive greats. 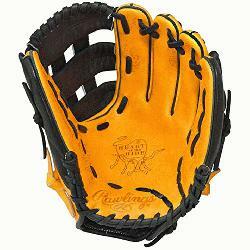 World renowned Heart of the Hide leather for unmatched durability Crafted from authentic Rawlings Pro Patterns Produced by the worlds finest glove technicians Soft full grain leather palm and fingerback linings provide exemplary comfort USA-tanned leather lacing for durability 11.75 Infield Pattern Pro H Web Conventional Back.